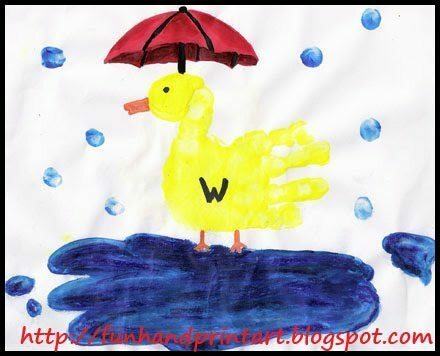 This Handprint Duck is easy to make. Place a yellow handprint in the center of the page. Next, paint a yellow circle for the head at the end of the thumb. Draw in the rest of the details after it has dried. I added a puddle of rain and and umbrella. I made rain drops using my son’s fingerprints. This makes a fun weather craft! The fingerprint raindrops are such a cute touch!